After years of preparatory studies, we are formally starting an astrophysics mission designed to help unlock the secrets of the universe. the Wide Field Infrared Survey Telescope, aka WFIRST. 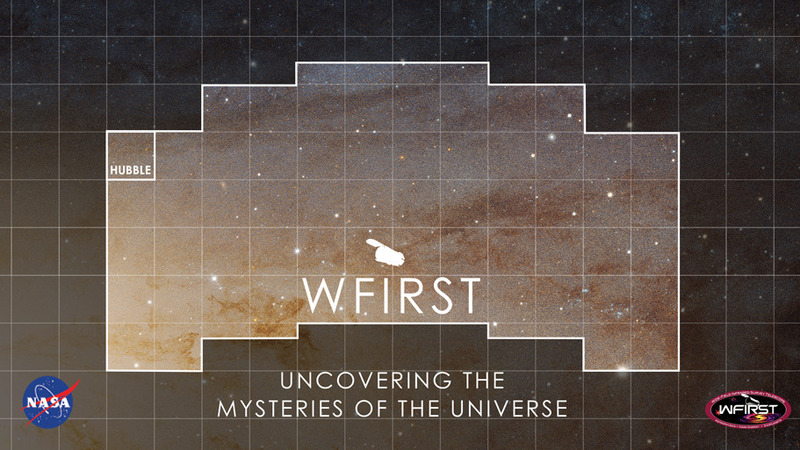 With a view 100 times bigger than that of our Hubble Space Telescope, WFIRST will help unravel the secrets of dark energy and dark matter, and explore the evolution of the cosmos. It will also help us discover new worlds and advance the search for planets suitable for life. WFIRST is slated to launch in the mid-2020s. The observatory will begin operations after traveling about one million miles from Earth, in a direction directly opposite the sun. Telescopes usually come in two different “flavors” – you have really big, powerful telescopes, but those telescopes only see a tiny part of the sky. Or, telescopes are smaller and so they lack that power, but they can see big parts of the sky. WFIRST is the best of worlds. No matter how good a telescope you build, it’s always going to have some residual errors. WFIRST will be the first time that we’re going to fly an instrument that contains special mirrors that will allow us to correct for errors in the telescope. This has never been done in space before! Employing multiple techniques, astronomers will also use WFIRST to track how dark energy and dark matter have affected the evolution of our universe. Dark energy is a mysterious, negative pressure that has been speeding up the expansion of the universe. Dark matter is invisible material that makes up most of the matter in our universe. Single WFIRST images will contain over a million galaxies! We can’t categorize and catalogue those galaxies on our own, which is where citizen science comes in. This allows interested people in the general public to solve scientific problems.